The OneDrive sync client now lets users sync libraries or folders in SharePoint or OneDrive that have been shared from other organizations. This scenario is often referred to as Business-to-Business (B2B) Collaboration. We’re calling this new feature in the OneDrive sync client "B2B Sync". This feature is currently enabled in the Insiders ring only (build 19.012.0121.0005 or later - see the release notes for rollout info). To try this feature, join the Windows Insider program or the Office Insider program. Mac: defaults write com.microsoft.OneDrive Tier "Insiders"
Azure Active Directory (AAD) guest accounts play a key role in making B2B Collaboration possible. A guest account at one organization links to a member account at another organization. 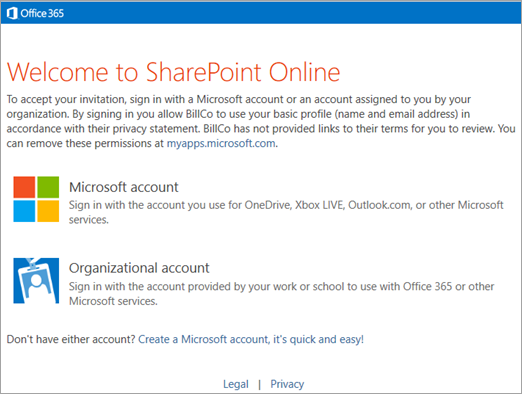 Once created, a guest account allows Office 365 services like OneDrive and SharePoint to grant a guest permission to sites and folders the same way a member within the organization is granted permission. Since the accounts at two organizations are linked, the user only needs to remember the username and password for the account at their organization. As a result, a single sign in to their account enables access to content from their own organization and from any other organization that have created guest accounts for them. External sharing must be enabled for your organization. External sharing must be enabled for the site or OneDrive. ADAL must not be enabled. The content must be shared with people outside the organization at the site or folder level. If a folder is shared, it must be through a link that requires sign-in. Sharing recipients must have an Office 365 work or school account (in Azure AD). This article gives an overview of the B2B Sync experience and describes these requirements in more detail. On the PC, if the guest's organization has applied Windows Information Protection (WIP) polices to their PC, the external organization's content will show as being owned by the guest's organization. It will be possible to copy content from the guest's organization to the external organization when it would be expected this would be blocked. This issue will be corrected in the next update. On the Mac, Files On-Demand thumbnails will not display from external organization's sites. Thumbnails will display correctly for files from the user's own organization. On the Mac, if the guest account was created with a different email address format than the form they are using with the sync client, the external site's content cannot be synced. For example, first.last@fabrikam.com vs alias@fabrikam.com. On the Mac, the external content may be placed on the local computer in the user's own organization's folder instead of one with the external organization's name. The Fabrikam recipient receives an email like the following. When the recipient clicks the link in the email to go to the shared item, they need to click "Organizational account" to sign in with their Fabrikam account. Behind the scenes, this creates the Contoso guest account in Azure AD. The recipient may need to enter their Fabrikam username or password, and then they can view the shared item. If they don't want to sync everything that was shared, they can browse to the library or folder they want to sync. To set up syncing, they need to click the Sync button. The guest’s browser will display up a message asking if they want to open "Microsoft OneDrive," and they will need to allow this. If this is the first time the guest has used the sync client with their Fabrikam account, they'll need to sign in. The email address will be automatically set to the Fabrikam account used in the previous steps. The guest needs to select "Sign in." The guest might be able to sign in to the sync client without entering their Fabrikam password if they're signed in to Windows with the same account. Otherwise they'll need to enter their password. The guest will confirm where they want to sync the shared item on their computer. The content is placed in a folder whose name includes the name of the organization ("SharePoint - Contoso" in this example). If the user is syncing SharePoint content from Fabrikam as well, they'll also have a "SharePoint - Fabrikam" folder. The guest will continue through the OneDrive sync client setup wizard. After closing the wizard, the site will begin syncing. The user can click the blue cloud icon in the notification area to open the OneDrive sync activity center and see the files syncing, open the local folder with the files, or open the SharePoint site in a web browser. To enable B2B Sync, external sharing must be enabled at the organization level. To do this, you must be a global or SharePoint admin in Office 365. After you enable external sharing at the organization level, you can restrict it site by site. A site's settings can be the same as the organization setting, or more restrictive, but not more permissive. On the sharing page in the in the classic SharePoint admin center, where you can also specify detailed options. For more info, see Additional settings. If you allow “anyone” links (sometimes referred to as “anonymous access” or “shareable”), these links do not create guest accounts and therefore don’t enable B2B Sync. For more info, see External sharing overview. When you allow users to share content from your organization externally, you can use several features in Office 365 to manage who has access to the content. 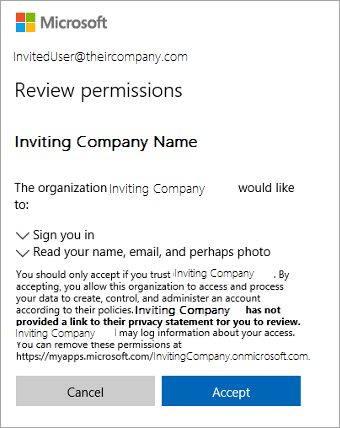 Office 365 admins and site owners can review permissions and audit access to sites. For info, see Searching for site content shared with external users and Turn on external sharing notifications. You can enable external sharing with only specific internet domains, or you can block specific domains. For info, see Restricted domains sharing. You can also allow only members of specific security groups to share externally. For info, see Turn external sharing on or off. We recommend creating separate sites (site collections, not subsites) for each unit of work that you want to share externally. This way, you can clearly annotate the sites to indicate that external users have access, and avoid unintentional disclosure of information. For individual users sharing content from their OneDrive, we recommend creating separate folders for different projects or collaboration groups. You can remove a guest's permission to a site or folder, or you can delete the guest account to remove their permission from all of your organization’s content. Any synced content will remain on the user's computer after permissions have been removed. To view or change the sharing setting for any site, use the new SharePoint admin center. If the classic SharePoint admin center appears, click Try it now to open the new SharePoint admin center preview. Under Sites, click Active sites, and customize the view as necessary to see the External sharing column. If you need to, change the external sharing setting for a site. On PCs, the Azure AD Authentication Library (ADAL) is not currently supported for B2B Sync. If your guest's organization has enabled ADAL with OneDrive.exe, or a user was configured using the OneDrive silent account configuration feature (which enables ADAL), the guest will need to disable ADAL on their PC for the preview of B2B Sync to work. If the guest's organization has device-based conditional access features enabled in Azure AD (where Intune marks a device as being in compliance with IT policies by placing a certificate on the device), they should not disable ADAL as the sync client won't be able to sign in. Location-based access policies and general MFA (multi-factor authentication) policies should still be compatible with the sync client's non-ADAL based authentication library. Run the following command to disable ADAL. In the search box on the taskbar, enter "OneDrive," and then click OneDrive in the search results. Users may need to enter their password after OneDrive restarts. If ADAL is enabled on the guest's PC, the following error will appear. If users are syncing a folder, they can right-click it in File Explorer to share it. Users can go to the SharePoint site or folder on the web and click the Share button to share the it. Users can share sites and folders in the SharePoint and OneDrive mobile apps. Admins can create guest accounts and use the admin center or PowerShell to add them to sites. For more info about these methods, see Learn how to share a site and Learn how to share a folder. For guests to sync shared content, the content must be shared at the site or folder level. Guests can't sync files that are shared individually (for example, from the Office apps). B2B sync works only when guest accounts are created in the organization, and when the recipient has an Azure AD account. It doesn't work when users share by creating an anonymous access link (also known as "anyone" link or "shareable" link), or when they share with people who have a Microsoft account or other personal account. As an admin in Office 365, you can share with people outside the organization by creating guests individually in the Azure AD admin center, and then adding them to a SharePoint team site individually or by adding them to a security group that already has permissions to the site you want to share. If you grant permissions by using the advanced permissions page (instead of by using the Share site button), you'll need to inform the guest that you've given them permission to the site. They won't receive an invitation email. If you use the advanced permissions page, we recommend granting permissions at the site level, not at the document library or folder level. If you need to create and grant permissions to many guest accounts, you can use the following PowerShell script, which creates guest accounts and grants them permissions to a site. The script takes a CSV (comma separated value) file as input, which contains a list of user display names and email addresses. For each name and email address, a guest account is created and that account is added to a security group to grant it permission. The script is designed so that you can feed the resulting output CSV as input to the script on a subsequent run. This lets you add more users to your CSV file or retry creating any failed account. As users are added to the Azure AD Group, they should receive an email welcoming them to the group. 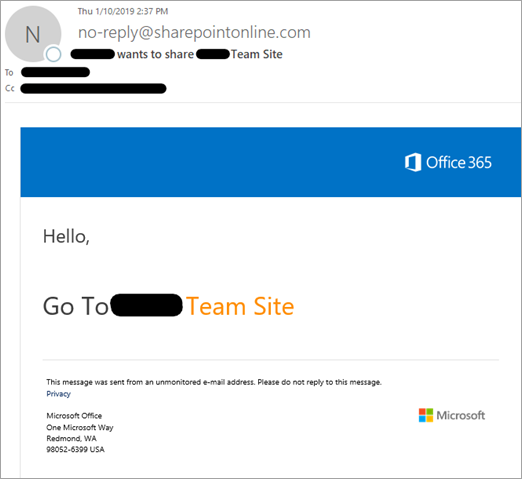 After running the script, you'll need to email the users with a direct link to the SharePoint site you gave them permissions to. When they click the link, they'll be presented with the below UI to accept the terms of the invitation. Once they accept, they will be taken to the site you shared with them. At that point they can click the Sync button to begin syncing the sites files to their PC or Mac. If a person’s guest account is deleted or their permission to shared content is removed, the sync client will display an error. A notification will appear indicating that the library can’t be synced. The OneDrive icon in the notification area will show an error. When the guest clicks the icon, they will see an error banner in the activity center. When they click the “One or more libraries could not be synced” banner, they can learn how to resolve the issue.